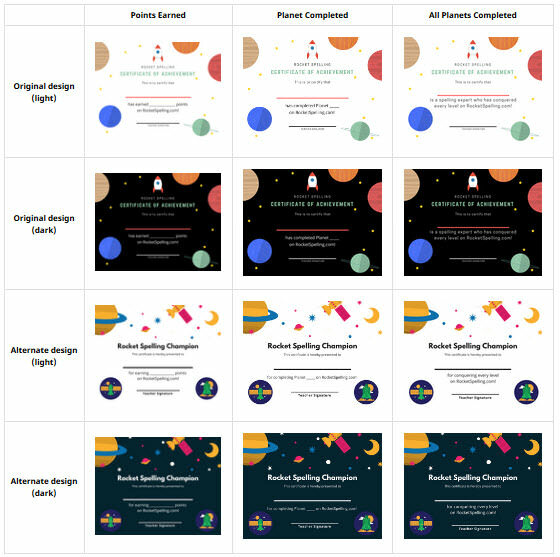 In your teacher account at Rocket Spelling, you will now see a new 'certificates' tab filled with 12 different certificates which you can use with your students. These come in three varieties: one certificate for attaining a certain number of points, one certificate for conquering an entire planet, and a final certificate for students who conquer all 120 levels on Rocket Spelling. These three certificates come in two different designs and in both light and dark backgrounds, for a total of 12 certificates in all. We hope that you take advantage of these new certificates as a fun way to celebrate your students' spelling achievements!